The Russian Defense Ministry said on Wednesday its intelligence had overheard Islamic State commanders talking to Al-Nusra Front about uniting forces against the Syrian Army. The Russian Air Force eliminated 83 militant targets in 46 sorties in the last 24 hours, bombing terrorist groups in five Syrian provinces, destroying camps, warehouses, vehicles and workshops, the MoD’s spokesman, Major General Igor Konashenkov, said in a briefing on Wednesday. The airstrikes hit targets of Islamic State (IS, formerly ISIS/ISIL) and Al-Nusra Front in the provinces of Aleppo, Damascus, Deir al-Zor, Hama, Idlib and Latakia. 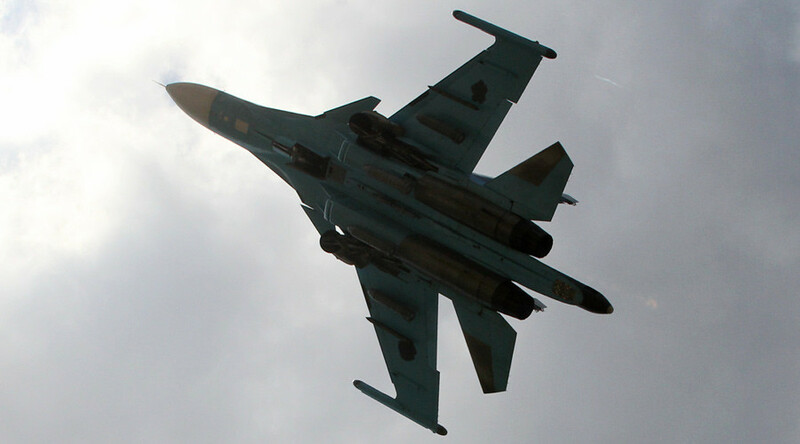 “An airstrike by a Sukhoi Su-25SM ground-support fighter jet group eliminated a large compound of Al-Nusra Front [Al-Qaeda’s branch in Syria] near the city of Khan-Shaykhun, together with all infrastructure, arms depots and vehicles,” he said. The spokesman said that another Al-Nusra Front installation, a workshop producing radio-controlled improvised explosive devices and explosives storage site, was destroyed near the city of Aleppo. “Following a precision airstrike conducted with guided bombs, the explosives stored in the installation detonated, eliminating the installation along with two trucks loaded with tens of tons of explosive materials,” Konashenkov added. Konashenkov also told journalists that IS militants are in talks with members of other terrorist groups, including Al-Nusra Front, to unite their forces against Syrian government troops. Al-Nusra Front and IS have been at loggerheads since February 2014, when the terrorist groups started infighting that resulted in bloody clashes. The MoD spokesman reported that direct airstrike eliminated a number of militant leaders holding a meeting in the vicinity of the town of Sarmin in Idlib province. “Last night the drones registered nine SUVs with mounted machine-guns arriving at the scene. A Sukhoi Su-34 bomber attacked the installation with a guided KAB-500 air bomb, which wiped the target out with everything that was inside,” Konashenkov said. A command-and-observation post of IS positioned atop of a mountain was eliminated by a Sukhoi Su-24M bomber in Idlib province. Also in Idlib province, another Su-24M eliminated a concealed arms depot near the town of Jisr al-Shugur. Konashenkov stressed that all aircrafts of the Russian task force in Syria have successfully returned to Khmeimim Airbase in Latakia having completed their combat assignment. Konashenkov also said that retreating jihadist groups have turned to tactics of massive mine-laying. The militants actively rig with explosives abandoned dwelling houses and objects of civilian infrastructure, equipping bombs with remote detonation units. “Many of such thoroughly-hidden explosive devices have countdown timers, set to blow up in a certain period of time, which in some case could be several weeks,” he noted, explaining that in such a way the jihadists hope to stage terror acts after the civilian population return to their homes and recovery works begin. Since the beginning of the anti-terror operation in Syria on September 30, Russian warplanes have eliminated well over 830 terrorist targets.